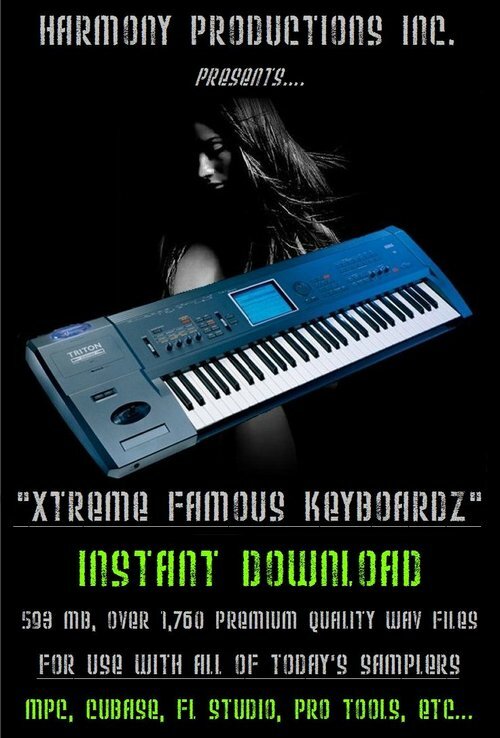 Xtreme Famous Keyboard Samples R&B/Hip Hop Production. A Multitude of sounds sampled from the Worlds Best and most famous keyboards. How many of us actually have $2000+, especially starting out, to blow on a board with hundreds of sounds you probably can't use, or, wouldn't even want to use, when our set cuts out all the bad and saves the good? We've got some of the hottest, most sought after sounds, from some the biggest and best boards on the market today. At the lowest, most cost efficient price around. We recorded each instrument at C, F and some at G to allow for maximum movement in your mix. We sampled each instrument long enough to accommodate any tempo track, for extremely diverse usage. Complete set of chords from A to G, major and minor. Complete bank of one shot notes From A to G.
Xtreme Famous Keyboard Samples R&B/Hip Hop Production. 1150336 6.99 harmonyproductions Fresh Download Available!